International Bibliography of Theatre & Dance is your best bet for locating a number of journal articles on your topic. Below is a video showing how to conduct a basic search. Note that if you choose to limit to "scholarly journal articles," that could remove articles from Dance Magazine and other reputable sources, so do so carefully! 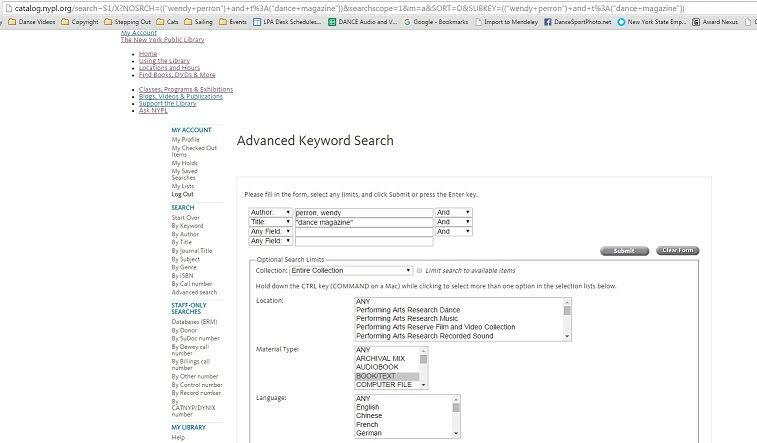 You can also conduct a search just within a specific journal. The video below explains how! You can also try the New York Public Library's catalog, which has indexed issues of the magazine: http://catalog.nypl.org/search/X Below is a sample search for the author "Wendy Perron," limiting the results to "Dance Magazine." Who Is Hosting This has an excellent 60-second guide to evaluating websites. Check out their tips!